The 2011 Orthodox Institute, held at Antiochian Village, near Ligonier, PA, over the weekend of November 3 – 6, was advertised as “an event like no other” and it proved to live up to its claim in more than one way. The theme was “Scripture through the Lens of the Holy Land” and this was the first time that the Orthodox Institute was a multi-jurisdictional collaboration between the host of the event, the Antiochian Department of Christian Education, and the Greek Orthodox Archdiocese, the Orthodox Church in America Department of Christian Education, and the Orthodox Christian Education Commission. To have a Pan-Orthodox event was a big draw for many attendees and exciting for those involved with the planning of the Institute. As a result, the attendance for the event broke last year’s record with over 140 guests. But the theme wasn’t the only enticement for the attendees. 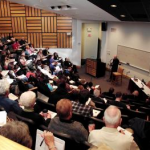 In keeping with last year’s new and improved (and very successful) Institute, this year again offered presenters well known in the field of Scripture, led by Fr. Thomas Hopko, book signings, a wine and cheese reception, a review of new materials for Church Schools, gifts throughout the weekend and the 1,000 square foot exhibit—an interactive tour of the Holy Land– led by Dr. Maria Khoury, author and speaker, from Taybeh, Palestine. Bringing the Holy Land to Antiochian Village was quite a feat requiring creativity and knowledge. Carole Buleza, the director of the Antiochian Department of Christian Education had a vision of displaying nearly-life-size photographs and maps, as well as artifacts, sights and sounds, costumes and plants so that participants could experience both sacred history and sacred sites. She used seven-foot banners that began with the Creation and worked chronologically through the Bible, so that as the tour progressed, participants could experience the entire Bible, both Old and New Testaments through the “lens of the Holy Land.” Dr. Maria Khoury related her own experiences as she led the tour. The exhibit was not the only highlight of the weekend. For many attendees, having the opportunity to hear The Very Reverend Thomas Hopko, Dean Emeritus, St. Vladimir’s Seminary, deliver the keynote address was the much anticipated event. He spoke of the relationship between the Old and New Testaments during his keynote addresses, entitled, “He opened their minds to understand the Scriptures,” (Luke 24:45) as he spoke about the Bible in Orthodox Tradition over the course of two evenings. He also conducted two sessions during the day on Friday and Saturday, “Overview of the Bible Part 1 and 2.” Everyone with whom I spoke agreed that Fr. Thomas Hopko was brilliant in his knowledge of the Bible, clear in explaining the Orthodox perspective, and adept at injecting humor into a serious topic. All agreed that they were looking forward to listening to him again and were hopeful of hearing the keynote addresses on Ancient Faith Radio. 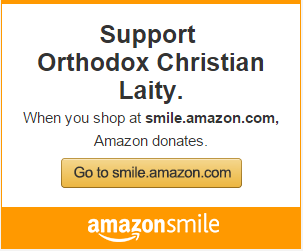 There were other reasons that guests chose to attend this year’s Orthodox Institute. Because it is a weekend of education, many guests came to receive training specific to their needs as either Church School teachers or directors. Guests had the option of selecting courses that would best help them in their assigned role in their home parishes. Therefore, by taking certain courses, participants could earn an Advanced Teacher Training Certificate, a Church School Director (CSD) Certificate, and/or a special certificate in “Scripture and the Holy Land.” Some attending had even been sponsored by their home parish to attend the training sessions. Whether it was the first time they had attended an Orthodox Institute or “never missed” this yearly event, all guests agreed that the experience of attending this training was one they will never forget and would be returning to their homes and parishes with a renewed spirit. The training courses were diverse and included topics such as: Creative Expressions, Church School Ministry, Child Development and the Exceptional Learner, Church School Director Curriculum and Resources, Women in the Bible, Building Staff and Students, Enriching the Classroom Experience, Adolescent Needs, Creative Festivals, Children and the Word of God, Moral Issues, Parish Bible Study, Teens and the Word of God, Vacation Church School Program, and Old Testament Revealed through archaeology with Dr. Nicolae Roddy. Other instructors included: Hollie Benton, Kh. Betty Randolph, Nike Bach, Dee and Al Kacere, Mat. Myra Kovalak, Vasiliki Oldziey, Kh. Leslee Abud, Gail Meena Malaniak, Fr. Fouad Saba, Timm and Kristina Wenger, Fr. David Randolph, Carole Buleza, Fr.George Alberts, Catherine Sullivan, and Kh. Gigi Shadid. Renee Acra from Wisconsin was attending to take the CSD courses. Although she came to hear Fr. Thomas Hopko, she received more than anticipated in “useful courses” where she could “listen to what others use in their Church Schools, see the resources and learn so much!” In attending this event, Renee gained many ideas and looked forward to returning to her parish to share what she learned. Kathy Kelly, a Church School Director, shared how the expense of the travel was more than worth it not only for the experience, but for the “amazing food!” She also said that the collaboration of the “OCA, GOA, and Antiochian Archdioceses and meeting others from across the country was great!” Lois Ball enjoyed how the Orthodox Institute brings the Orthodox community, usually so isolated, together as one group, unified in belief and desire to learn. As I flipped through the final evaluations of the weekend, it was overwhelmingly evident that this Orthodox Institute exceeded expectations for the attendees. 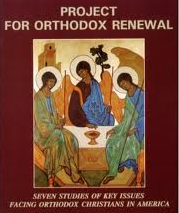 There were many reasons listed for that assessment, but the one theme that resonated with the majority was the pan-Orthodox unity the participants felt. On the way home, I felt so very thankful to have been a part of this Orthodox Institute. I was reminded of the theme from the Sunday of Orthodoxy: “the victory that overcomes the world–our faith.” (1 John 5:4). I know that as a result of this weekend, I and many others now have a continuing desire to read and understand the Scriptures through the eyes of the Orthodox Church.